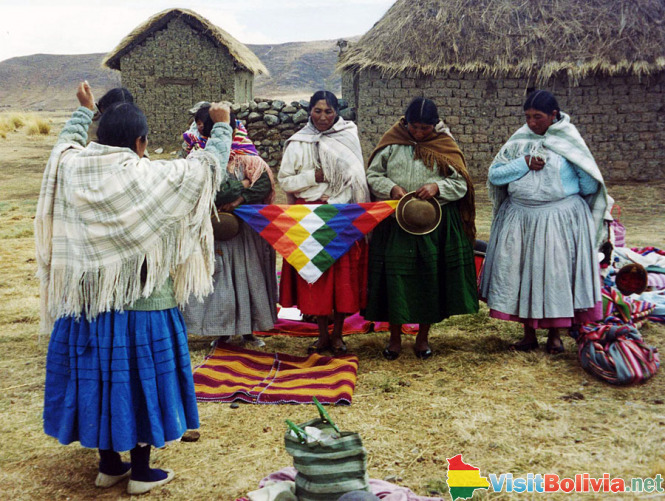 Bolivia is a nation of rich cultural heritage. Perhaps nowhere else in South America can you experience such a rich blending of Colonial Spanish and traditional Inca culture. Ethnically, roughly sixty percent of the Bolivian population is of American Indian descent, the largest groups being the Quechua and Aymara, Inca descendants native to the mountainous Andes region. The remaining forty percent of the population is rounded out between mestizos (those with mixed Indian and European ancestry), those of European descent, and many small Amazonian cultural groups. The official language of Bolivia is Spanish, with roughly 87% of the population speaking it on some level. However, many Bolivians continue to use traditional languages, especially Quechua and Aymara, as their mother tongue. Most Bolivians who do speak traditional languages at home are bilingual, especially in the cities. Traditional dress is still commonly worn, especially in rural areas. Women wear long, often colorful skirts called polleras and undersized bowler hats. In some localities, the positioning of a woman's bowler hat can indicate her marital status. Traditional dress for Bolivian men is the poncho. 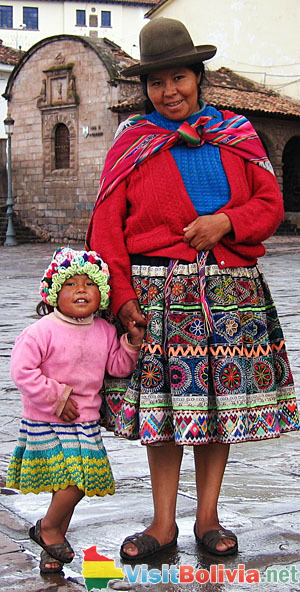 Within Bolivia's cities, it is more common to see Western style clothing, though women still tend to favor dresses and skirts. The blending of the Spaniards' Catholicism and the indigenous Inca traditions produced an array of colorful festivals throughout the country. Bolivian music and traditional dances both show this melding together of two cultures. One of the more distinctive festivals include the Tinku-fertility rites held around May 3 in Macha, which feature ritual conflicts using traditional Inca weapons such as slingshots, clubs, whips, and bolas. Another is the death dance performed at the Pujllay in Tarabuco, in the Andean Region. The festival is help in conjunction with Carnivale, and celebrates a Quechua victory over the conquering Spaniards. Perhaps the greatest cultural experience in Bolivia, though, is the Carnival of Oruro, a three day celebration beginning forty days before Easter. The festival combines features of ancient Andean beliefs with Catholic symbolism and the belief that the Virgin Mary appeared in a silver mine shaft in 1789. The highlight of the festivities is a 20 hour procession, featuring Bolivian music and dances and finishing with two dramatic presentations, one of the Spanish Conquest, and the other of the Archangel Michael battling the Devil. All told, Bolivia manages to blend the best of both worlds in her rich tapestry of diverse cultures and people groups. Wherever you go in Bolivia, you are sure to find evidence of the rich cultural heritage of her proud people, from the pre-Columbian traditions to the Spanish Colonial to the modern Republican influences. You're sure to agree Bolivia is among the most fascinating destinations on earth.